awesome hdr! your reflection is placed perfectly too! There’s nothing I can tell you that would change or improve your work, but I can say that I wish I had a room or six full of it. 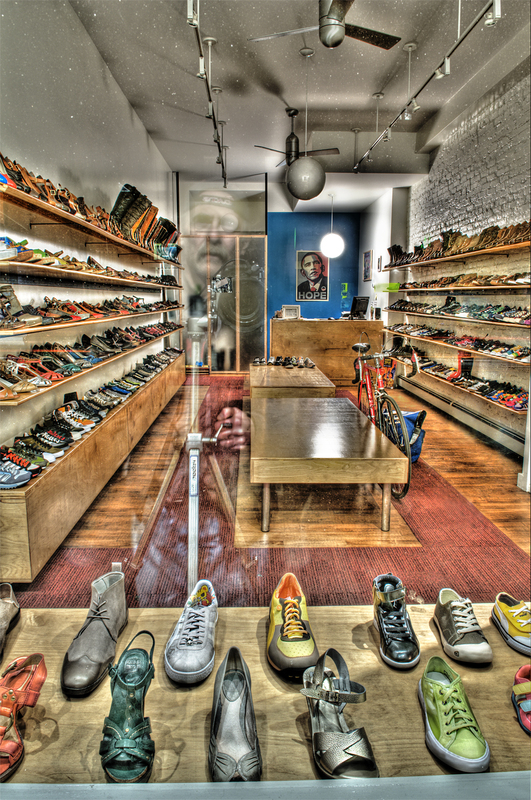 This is just amazing, I love how you have taken just a shoe store and created a work of art. I also love how you have incorporated the photographer (you ?) into the work. I think this is a great work of art. At last………..an image to go with your name! I love the way your hand hangs in space, as if an eerie monster coming out from under the table. Simply an amazing piece of work! It expresses so many things, the way the light is set makes it interesting and I just love the way you included the self portrait. Excellent work! really a great shot, i like the reflection! maby a little too much hdr for my taste but i still like the surreal feeling. I’ve never seen such a beautiful and vibrant work of art. Thank you for sharing. WOW-Amazing shot! I love how you incorporated a self portrait in the reflection. The image is very deep, filled with multiple messages. The sense of interior and exterior worlds, the “hope” of new shoes combined with the “hope” of our president, glass, reflections,identity, etc…OUTSTANDING! I’ve always been impressed with your work, but,I haven’t looked at in a while. It is just so inspiring! GREAT WORK.